I hardly know where to start. 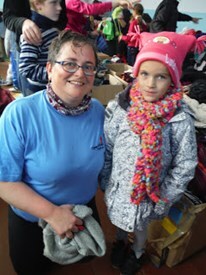 I got home on Sunday after spending last week with a terrific team kitting out over 1000 Moldovan children for the coming winter. I was physically and mentally exhausted (probably more from the travelling! ), but so pleased to have been a part of this amazing experience. My first impression? AUTUMN! You have to live on a virtually treeless island before you truly appreciate a landscape in full autumnal colour! A bit of background, Operation Orphan were running their Keep a Child Warm Project in Moldova for the second year extending the number of schools covered after building relationships within the community with schools, charity and social services. I have been involved in supplying Operation Orphan with knitted and crocheted clothing through Loving Hands and Knit a Square to Give Your Share, groups of people who craft for charity. I got my 25 year bonus from the council in December and took the opportunity to use the money to to go to Moldova and see the process through. I also collected four pallets worth of winter clothing from the amazing Shetland public which was shipped to the charity by JBT for packing for the project. I also did fundraising, raffled a blanket and had donations from Shetland Rotary Club, North Mainland Gardening Club and Angela Sinclair Massage, all of which went towards getting the donations to their destination. Victor and his family, our hosts on Sunday. As Operation Orphan’s Team Moldova 2015, we visited 3 village schools and 2 village nurseries, plus a mother and baby unit and the Children’s Centre in Cahul – the regional centre – where children with disabilities can spend the day, if their parents can transport them to the centre. Out of the towns there is little, if any, provision for children with special needs and most spend their days at home, possibly alone if the parents are working or working the land. Toys made by Loving Hands members were left here for the classes to use and for the children themselves. Blanket made by Ollaberry School pupils finds a new owner. We clothed over 1000 children with hats, gloves, scarves, coats and jumpers and the nursery children all got a blanket too. Many of the items we distributed were handmade by people knitting and crocheting to donate to charity, Loving Hands members among them. I believe I must have handed out many items made by Loving Hands, I know a child went home with a blanket I had made, another with a blanket made by a friend of mine, I saw a hat made by her daughter and gave out blankets sewn together from donated squares by the children of Ollaberry School. Those items could have gone to Sierra Leone or Ukraine, but they were there in the boxes in Moldova for me to see the process through to the end, closing the circle as it were – truly special! As well as a few other words! Days two and four were spent kitting out the younger children from the nurseries – aged 2-6. Some were tiny, some cried – as you would if taken from your classroom by a complete stranger who spoke gobbledy-gook – and some giggled their way through the whole experience, we can apparently be very funny! Whatever the age, children can have strong opinions on what they like and I can tell you girls in Moldova like sparkle, pink and fluffy! Boys tend not to want a blanket with a pink square in it – crafters take note! Blanket – fluffy and with pink bits! The staff were allowed to come in after the children and take any items that could clothe their families, neighbours and friends’ children. This was the time I found hardest. The children would have been none the wiser if we hadn’t come, this winter would have been like the last. The adults however knew the difference we were making, they knew that the kids would be warmer, that there would be more money for food or fuel in their homes. The director of every school told us the difference that this makes, thanked us on behalf of their pupils, staff and communities. We were given gifts of fruit and a loaf of bread baked specially for us. They shared food with us – local cheese, tomatoes, cheese pie. I believe that the last week in October 2015, we made a difference to those communities and I am so grateful for the opportunity to have been there. Clothing is expensive in Moldova and this was brought home to the team when we took a teenage disabled lad out to the shops to buy clothes, an orphan he arrived on the social services doorstep with what he was wearing, which wasn’t much. As an exercise in showing the cost of clothing a child, it was a hard one! We bought him a pair of trainers, a pair of winter boots, a pair of trousers, a t-shirt, two jumpers, a pair of pyjamas, six pairs of socks and six pairs of underwear and a coat. He also got a hat I had crocheted on the plane out. The shopping cost £135, which would be a bargain here – however the average monthly take home pay is £50 and a school director (head teacher) earns the princely sum of about £130 a month. The equivalent cost for those clothes if bought here in the UK would be about £1000! That’s why the Keep a Child Warm Project means so much to these people, that’s why an elderly cleaner found out how to say “Thank you!” in English to me, why a teacher who showed me her classroom and the photographs of her pupils whom we had clothed said, “Merci! I love you!” when saying goodbye. He hugged this blanket so tight! On a lighter note, we did fall foul of one member of staff in one school – the cleaner came in and gave us a row (in Romanian but there was no mistaking what she was saying!) for cleaning up after ourselves because she was going to do it! What next? For myself, I don’t know. I would love to do this again. If anyone is thinking about taking part in something like this – do it. For folk who want to donate handmade items for next year – can I suggest if you make gloves – PLEASE tie them together – I spent a lot of time peering into a box pairing gloves! Blankets – bigger blankets and lots more!! I would love for Operation Orphan to have enough blankets for every child to get one, not just the younger ones. Baby blankets have limited use as they can only be used in prams, blankets of at least 5×5 8” squares can cover a toddler, 6×6 is better and single bed size is best. Families often share beds so bigger blankets can cover more people! If you can’t make a blanket, make an 8” square and if you live in Shetland send it to me, I’ll get it joined to some more and then there will be a blanket! If you live elsewhere, team up with some people and make one between you, or look at the Loving Hands forum for ideas of where you can send them. There is no time limit on this, you can make a square here and there and when you have enough make a blanket. If you can’t donate with items to be given out, perhaps you could help financially to get everything transported? Many thanks to the team that was with me in Moldova for the support, the laughs and the sheer effort, not forgetting all the work that the Operation Orphan team put in getting everything in place for us.